Another Tommy Lasorda book. It's titled 'My Way'. But of course that's a homage to Frank Sinatra. It's written by Colin Gunderson, who worked for the Dodgers and was an assistant for Lasorda. Foreword by Hall of Famer Joe Torre. 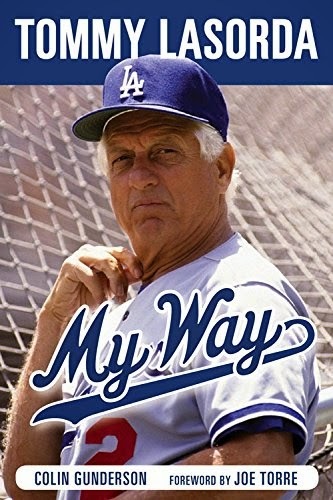 Tommy Lasorda believed that winning wasn't about being the best, but about believing you are the best and that philosophy runs throughout Tommy Lasorda: My Way. Author Colin Gunderson takes readers through Lasorda's days as a player and the manager of the Los Angeles Dodgers, including their two World Series Championships in 1981 and 1988. It also provides fans with a peek at what makes Lasorda tick: his relationship with his father, Sabatino, whom he emulated; his childhood growing up in Norristown, Pennsylvania, working odd jobs; and his unfailing work ethic. That work ethic helped him become one of baseball's most successful managers as he won the World Series twice, won four National League pennants and eight division titles with the Dodgers. In this book, fans will recall some of their favorite Lasorda anecdotes, and will also be privy to new information and rich background on this national baseball treasure, including memories from an All-Star roster of Dodgers stars.